I’m in the Northern hemisphere. The winds are brisk and cold right now. Accordingly, though I love the dress from the last post, I need something a bit warmer to carry me through this hunt. A nice knit head to toe to keep me warm. This is Ali Couture’s -AC- Sugar Sweet ensemble. Complete with prim collar and cuffs for extra warmth. So what are ‘prims’, you ask? Essentially, in these days when mesh objects are not yet widespread, prims are the primitive shapes from which every object in SL is built. Initially, all prims were fundamental shapes – such as cubes, spheres, prisms, toruses, cones, pyramids, etc. These basic shapes were quite useful as is, but could be further modified by trimming away portions of them to yield more complex shapes. Somewhere along the line, prims gained the ability to be made from ‘sculpties’ – more complex shapes that could be generated in offline tools, and imported into SL as if they were textures. Today, mesh objects are just starting to be employed. We’ll doubtless speak again of prims at a later date… yes, I’m quite sure. OK – this post is just a fashion post. This is from Sassy! . It is called the ~Sassy!~ Precious II gown. I love the lace detail. Both the upper and lower sections come on multiple layers. OK – layers. Recall that your clothing, like your skin, consists of both textures that are essentially bodypaint, and objects which exist independently of your body. The bodypaint portions (skin, makeup, hairbase, tattoo, undershirt, shirt, jacket, underpants, pants, socks, and gloves) form defined layers over your body, in logical fashion. Jackets cover shirts, shirts cover undershirts, etc. As an example of why it is desirable to have an item come in multiple layers, suppose my top was on the jacket layer. If I wanted to cover up with a shawl, I could not, as each layer can accommodate only one item. So my top could be on the shirt layer. But it would make a lovely camisole as well would it not? If I wanted to wear a shirt over it, they would be fighting for that layer. Undershirt? What if I wanted a bra peeking out? For flexibility, most better ensembles feature a number of their items on multiple layers, so they can be mix-n-matched with other items. I did not want to say it, for fear of angering the Creator. I have succumbed to vanity. With all that is me, I want to be pretty. I know it’s petty. I know it shouldn’t matter. I know I have business to attend to. But I am weak – I am, after all, merely of the virtual flesh. Cast adrift, a loner tasked with a special purpose. Yet I want to be loved. I want to — need to be desired. A fairly recent SL commerce event is The Hunt. These have started to become widespread in the last year and a half or so. We have spoken before of ‘freebies’ which are items given freely in order to demonstrate the quality of a vendor’s goods. If one combines freebies, with a mechanism for increasing traffic to the vendor’s store, so much the better. Entre’ the Hunt. In a hunt, an av is given the location of a store, and a description of the item for which one is hunting. The store owner hides the hunt item, in the hopes that, while seeking the item, the hunter sees, notices, and is enticed by the wide range of wares sold by that vendor. Once the hunter finds the hunt item, she is rewarded with the gift (sort of a freebie, but required the search to locate), and a landmark to the next store in the route. At that next store lies waiting another hidden hunt item, itself containing another gift plus the landmark to the next location. Hunts are organized by various persons and groups, and usually have a couple-dozen to slightly less than a hundred stores in the route. This makes a nice way to quickly obtain a lot of clothes, hair, poses, and other things for free. As it so happens, upon breathing life into me, the Creator was in the middle of such a hunt. Accordingly, I was birthed with her knowledge thereof. Further, this hunt was of a quality that was higher than average, and contained many things which I wished were mine. 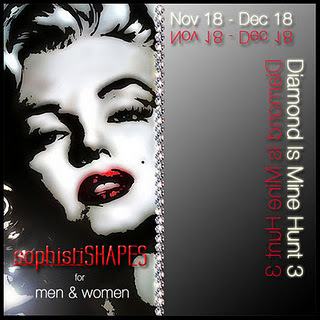 Unable to resist the earthly temptation, I embarked upon the Diamond Is Mine Hunt 3 . Indeed, the eyes I listed in the last post were from this hunt. Further, the very first item in this hunt was a shape that so complimented the shading in my al vulo-frida* passion tan skin, that it seemed almost made for it. Full frontal below the fold…. Remember The Man Who Fell To Earth? That 1976 movie where David Bowie played the protagonist — an alien from a dying planet? Remember the scene where he removed his contacts — the contacts he needed not to be blinded by the earth’s unfamiliar electromagnetic spectrum? That scene creeps me out to this day. What does that have to do with anything? Not much really, but my eyes aren’t working for me. Right – the eyes that came with the free Vampire Female Jayde av from Linden Lab. They just look so… I don’t know… orange and rheumy. Who wants to go through life with jaundiced looking eyes? In SL, you get to change your eyes at will. Match your eyes to your shoes — why not? So I went on the lookout (oh no you di-int) for new eyes. Tried several pairs, brown, blue, green, but seemingly no changes. What the heck? Then I discovered – this vampire female starter av (which is still most of what I am) came with objects that are worn over the eyes. Contacts of sorts. Huh. Learn something new every day. As if there is anything but a perfect 25 year old body in SL — why would I need contacts? I guess they must glow in the dark or something. After pulling the wool from my eyes, I felt much better. Here I am sporting Bad@zz Eyes – Blue – Lighter Shade Iris/Large Size Iris. Ahhhhh. This dressing up is starting to be fun! I scream Mom and Dad Why can’t I be who I wanna be? Whew! The new skin is a relief. I am no longer draped in the visage of a vampire. Now I can get to the business for which the creator has cast upon these shores. Hoo, dawgie. If there is one facet of appearance that causes all of humanity (both virtual and meatspace) grief, disagreement, and strife, it has got to be hair. Jocks versus hippies, parents versus teens, skinheads versus metalheads, mods versus rockers, preps versus goths, it goes on and on. Look at a photo from some decade gone by. I bet you can place the decade just by reference to the hairstyle alone, can’t you? As opposed to RL, in SL, all hair (other than stubble, which would be a texture applied to your shape as your skin) is as a wig. I bet Dolly Parton doesn’t give a second thought as to whether or not she’ll don a wig any given day, do you? With the knowledge that everyone in SL is always wearing a wig, it is not uncommon to have dozens – even hundreds of wigs at your disposal. Changing your wig daily — even hourly — is no big deal. Nobody would bat an eye if you showed up at the next party with a pink & blue bouffant. So how could I possibly put myself forward in a confidant, business-like manner, with a drowned long-haired rat perched atop my head? Especially knowing how trivial it is to choose your hair. Even more so than with skins, there are many purveyors of fine hair eager to capture you as a customer. Most hair vendors have dozens of hairstyles, each in dozens of colors. If they were to give away one style in one color, what of it? If the customer might fall in love with the look and craftsmanship, they can certainly give away a sample. After all, even if it is the exact perfect match for a given av, certainly there will come a day when at least another shade would be required to match a certain dress. At that date, there will be revenue. And so, there are many fine hairs from which Sparxx… errr… an interested party could acquire for free. Again, being poofed into existence with a complete trove of mature knowledge has its benefits. As the creator knew, so knew I — that an excellent hair designer was currently giving away many hairs, all across the grid. And so I set out to Alli&Ali, also known as A&A. http://slurl.com/secondlife/Wonderland%20Beach/156/135/24 . After joining their update group, I was allowed to obtain this week’s group gift – A&A Isis Hair Toast. I believe the style is Isis and the color is Toast. I grabbed one or two other freebies while I was there – little did I know that Isis Toast would fit me just fine for my first several weeks. Yes, I could certainly go about my life, and not be self-conscious about my hair, wearing A&A Isis Toast.